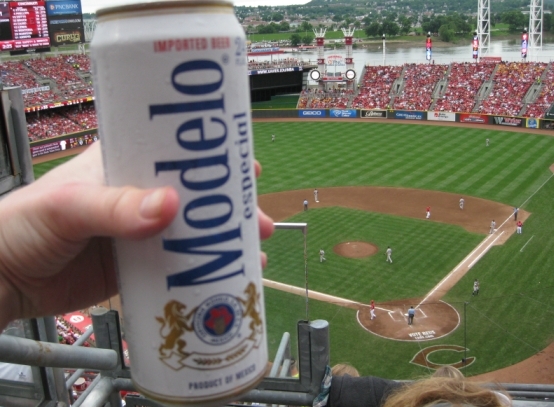 Last weekend I drove to Cincinnati with fellow Mop-Up Duty writers Early and Daperman to take in the 3-game interleague series between the Blue Jays and the Reds. 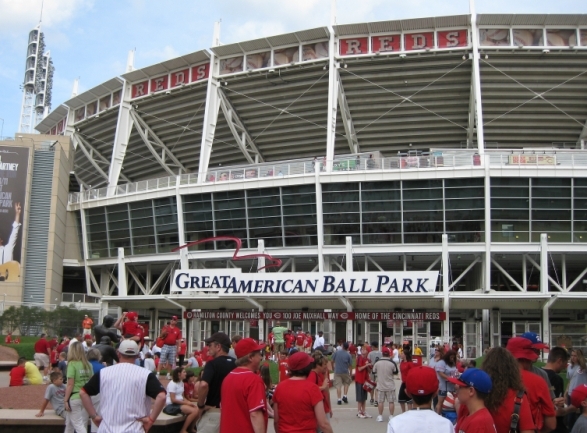 The Great American Ballpark, as it is known (named after an insurance company), has been home to the Reds team since it was built in 2003. It replaced Riverfront Stadium/Cinergy Field, the Reds home from 1970 – 2003 and one of the most unremarkable baseball stadiums in the history of the game. Situated on the banks of the Ohio River, the Great American Ballpark is located in one of the more picturesque settings in the majors. From the outside looking in, the stadium has a very modern look to it with painted steel, limestone and brick with clean lines and plenty of glass. The ballpark was designed by HOK Sport – the architects responsible for all of the retro-style ballparks like Camden Yards, AT&T Park, Comerica Park et al. That being said, I would not lump the Great American Ballpark with those aforementioned stadiums. Apart from a few nods to the team’s past, there is not much that can be deemed “retro” about this ballpark. The seating capacity is approximately 42,000 – just a few thousand less than the SkyDome. However, the ballpark has a far greater feeling of intimacy than our beloved Dome. At first glance the ballpark reminded me of Coca-Cola Field – home to the minor league Buffalo Bisons of the AAA International League (and also designed by HOK). The way the designers were able to achieve this “feeling of intimacy” is through “the gap” – a 35-foot wide break in the stands between home plate and third base. This gap allows the upper deck to be closer to the field than most stadiums in baseball. As well, it allows views from downtown Cincinnati into the ballpark and out to the skyline from within the ballpark. 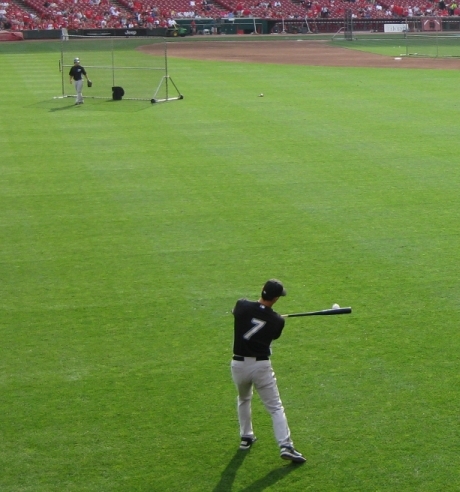 The intimacy of the ballpark is also evident when watching batting practice. This place is a literal bandbox with flyballs literally jumping out of the place. The dimensions are standard for most big-league parks: 328 down the LF line, 404 to straightaway centre, 325 down the RF line. In the back of the center field fence is a shrub-covered slope and the “Batter’s Eye Pavilion,” a lounge with dark windows. 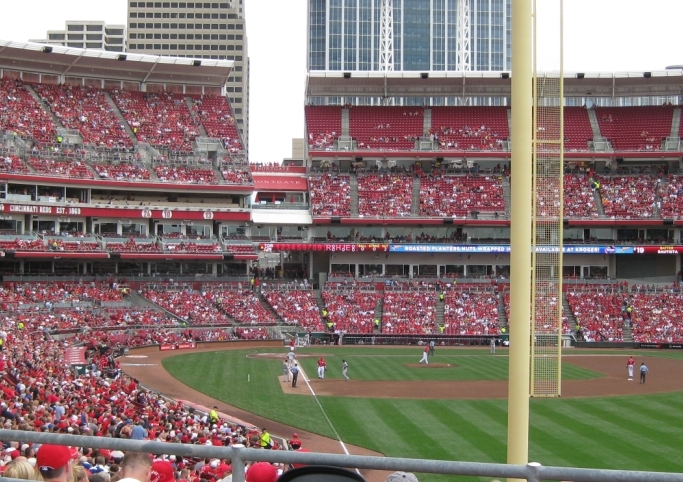 In addition, there is a distinct bend in the fence in dead center field, which was presaged by the similar “bent” fence in “Cinergy Field” during its last two years when the outfield grandstand was demolished to make room for construction on Great American Ballpark. Foul territory is miniscule. This “Batter’s Eye Pavlion” is attached to a pseudo-riverboat-party zone, a private party area located above the batter’s eye. Providing panoramic views of the entire ballpark and the Ohio River, the Riverboat Deck provides multiple groups of 25-150 a unique party option during Reds games. Package price is $67 per person for all regularly priced games and includes ticket, buffet meal and beverages. 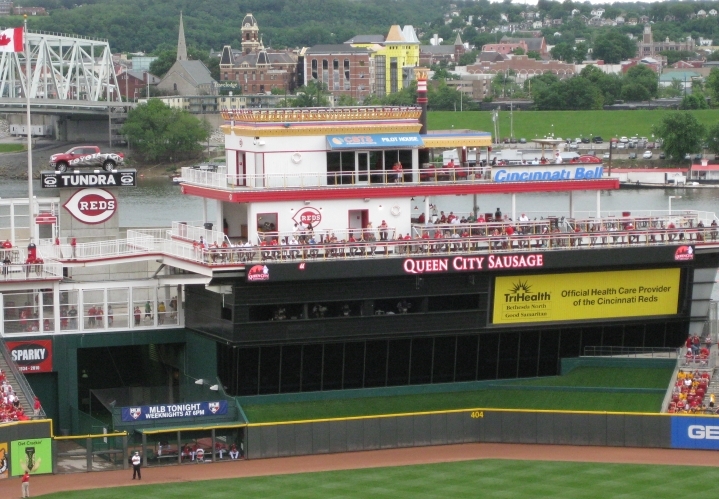 The Cincinnati Bell Riverboat Deck is located on the center-field Suite Level concourse and is similar to that of Sightlines Restaurant but with more of a party atmosphere. 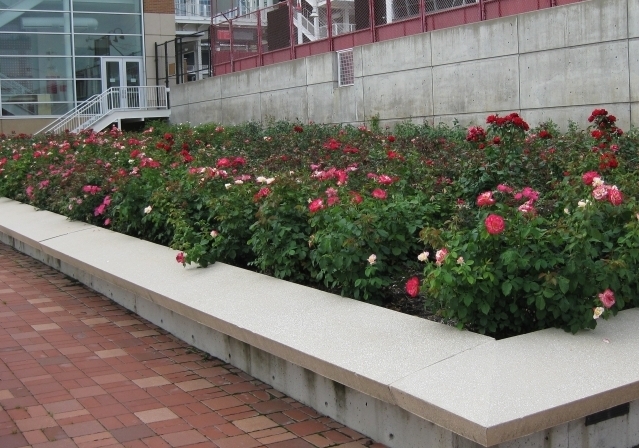 Outside the ballpark there is a tribute to Pete Rose in the form of a Rose Garden. It is said that there is a solitary white rose that marks where Rose hit his 4192nd hit but I couldn’t find it. Still, it is a nice thing. Often times Jays fans will notice a lot of grey heads in the stands at the Rogers Centre. These same fans (and sports media/talk radio types) will fret that there will be no transfer of stewardship from the old generation to the new generation of Blue Jays fans when it comes to showing up and supporting the home team. Well, the Reds have an interesting gimmick to try to attract the coveted 18-35 demographic. Happy hour drink specials, singles mixers and live music is in play to get the young kids out on a friday night. 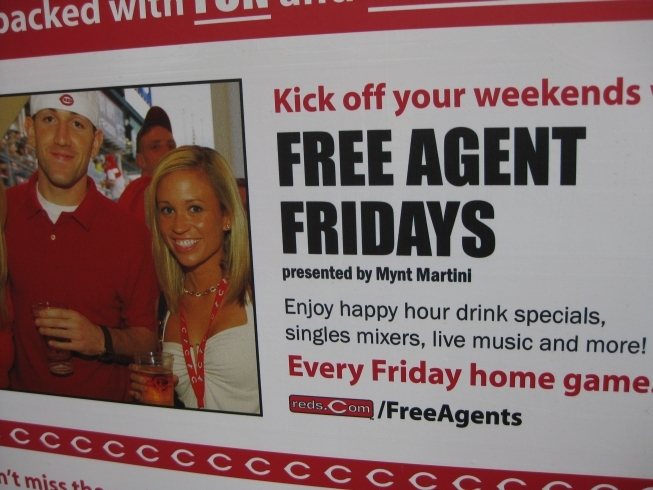 As you can see, “Free Agent Fridays” promises hot, tanned, blonde-haired and blue-eyed babes ready to party at the ballpark. In reality it’s going to be 99 nerdy, blogger-sabermetric-dude-types for every one girl who happened to make a wrong turn on the way to the washroom. Once inside the ballpark you will notice that it is quiet. Not eerily quiet, but very quiet for a baseball game. Great American Ballpark has all of the kitschy sound effects and top 40 music that is found at every other ballpark, but the fans themselves are very reserved. That is, until the 9th inning. With 2 outs in the 9th and the Reds were up, the ballpark became deafening. Cincinnati fans were the most friendly, accommodating fans I have ever encountered as a visiting team’s fan in an away ballpark. They were courteous as well as curious about Canadians and the Toronto Blue Jays in general. As far as the ushers were concerned, I had no idea what their purpose was. Just like at Angel Stadium, fan decorum simply does not exist. Fans were walking up and down the aisles and through the rows in the middle of plays. The only time they did do anything was to kick Jays fans out as soon as possible immediately following the game. To be fair, it was only 1 or 2 dicks and they do not represent the majority of the usher staff. 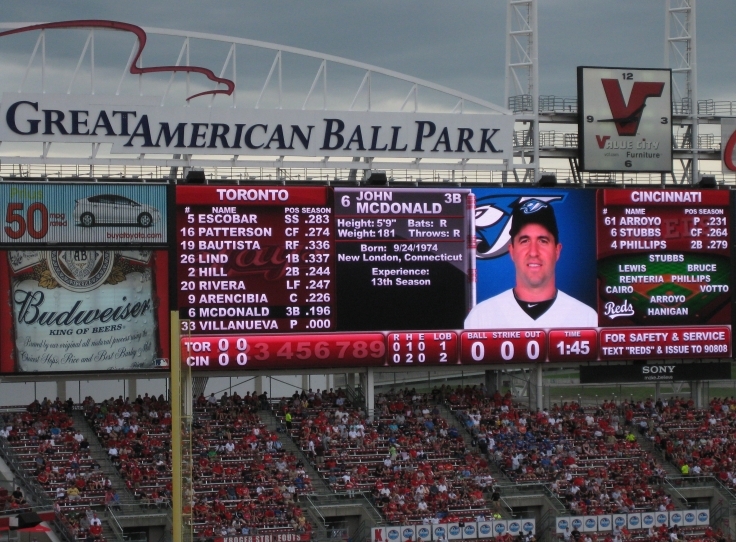 The most surprising thing was the amount of Jays fans that made the trip to Cincinnati. 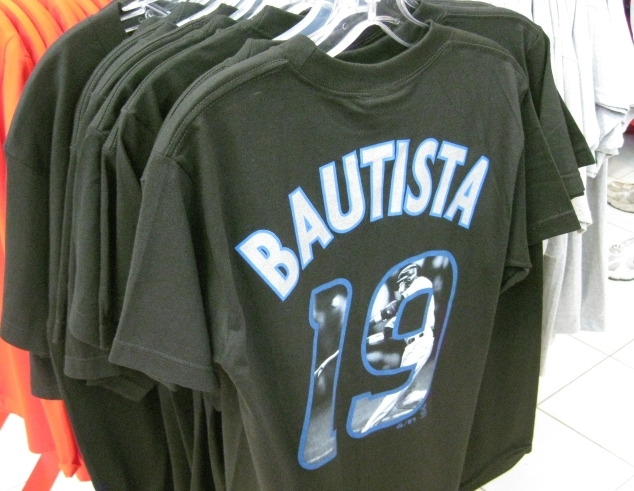 At least 1500 of the 30,000 fans on hand were sporting Jays t-shirts, jerseys or hats. For a fan base perceived as “lackadaisical” to put it nicely, it made me proud. Fans were also very friendly outside of the ballpark. 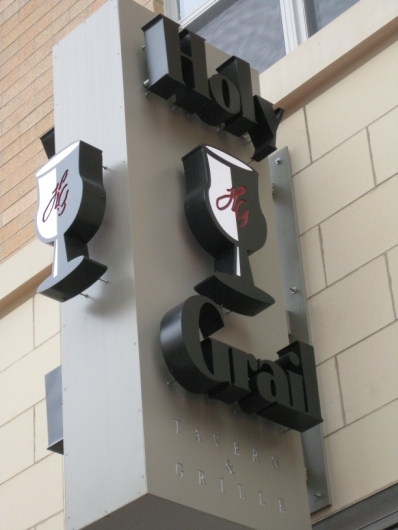 As far as the party zone surrounding the ballpark, it is limited to hotel lobby bars and one bar across the street: The Holy Grail. The Holy Grail fills up with Reds fans about 2 hours before game time and is a very lively party zone. It was here that I introduced Early to the nectar of the gods known as the Arnold Palmer/John Daly. It involves Sweet Tea Vodka from neighbouring Kentucky with Lemonade and ice. 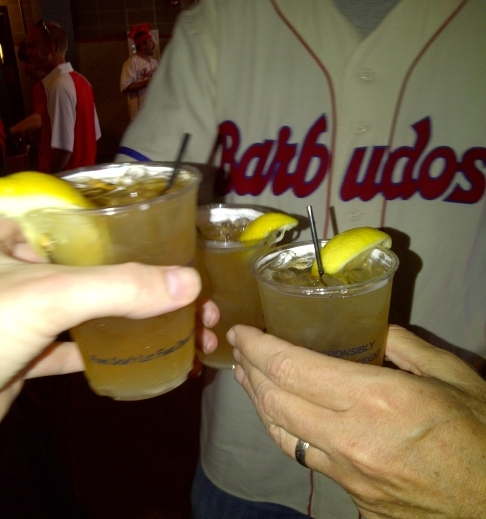 It is, as they say, a “party in a glass.” Baseball games from all over the league are broadcasted inside on large HD screens. Outside, Red fans mingle with opposition fans to talk baseball. It’s a similar atmosphere to the bars found at Wrigley Field, if you’ve ever been. Post-game The Holy Grail is also the place to be. Embracing drunken baseball revelers with open arms, the Holy Grail party really gets going with rock anthems played along with west coast baseball games. Reds and Jays fans got down with their bad selves like they had been best friends their entire lives. Highly recommended. The most popular question apart from “Where do the high school girls hang out around here” pertains to the drink selection at the stadium. Cincinnati does it up right. Small draft domestic beers are only $5.00 while regular are only $7.50 (much less than the SkyDomes $10 a pop!). Not only that, but there are a wide variety of imports and craft beers. Modelo Especial (amazing), Leinenkugel’s Summer Shandy (too sweet, disappointing), Landshark (delicious), Dos Equis and Sam Adams are also available. Bud Light Lime is available on tap. There are a few drink gimmicks as well. 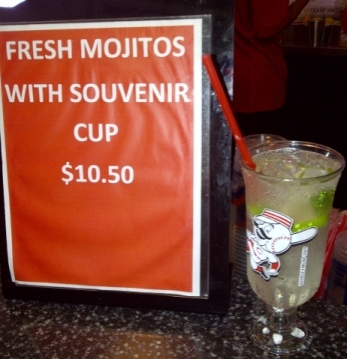 Daiquiris, Margaritas and Mojitos are available for $10.50 each and they are served in a collectible souvenir glass. Ask nicely for more rum and they will give it to you free of charge. Spill your Mojito all over the bar without even having had a sip of it and they will make you another one gratis. Southern hospitality at its best. 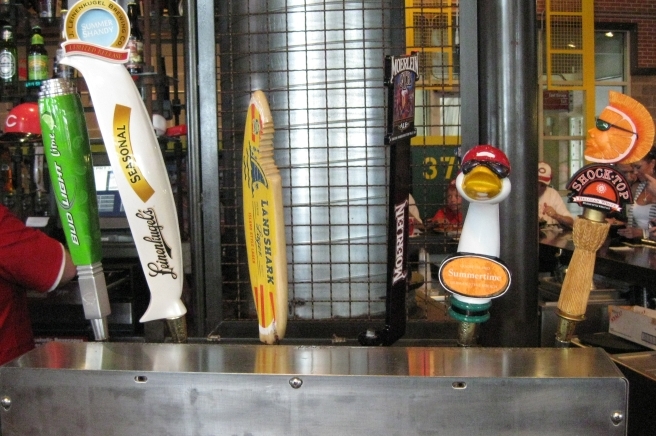 Great American Ball Park’s brewpub “The Machine Room” is located on the Suite Level in the left-field corner and is a dedication to the Big Red Machine – the Reds teams that dominated baseball in the 1970’s. 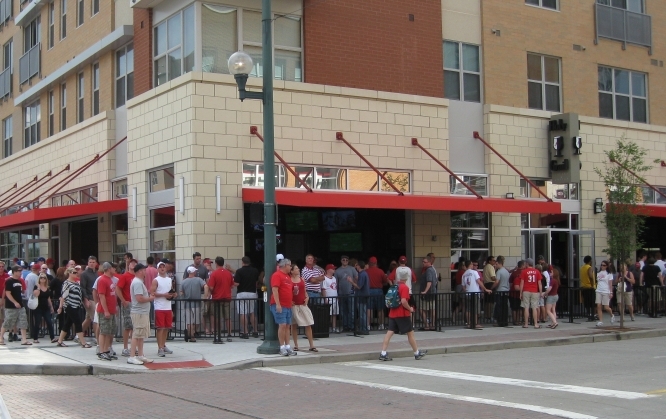 This spacious bar and grille has a blue-collar feel, much like the Reds team of the era. Brick and steel finishes, with an exposed ceiling, set the tone. Additional features of the brewpub include a mini electronic scoreboard, views of the playing field, mock foul poles, outside seats, the zamboni used at Cinergy Field and plenty of Reds memorabilia. Dishes include everything from burgers to pizza to barbeque. They also have a party deck similar to what you would find at Progressive Field, though not as large. And yes, they will make you a John Daly if you crave it. 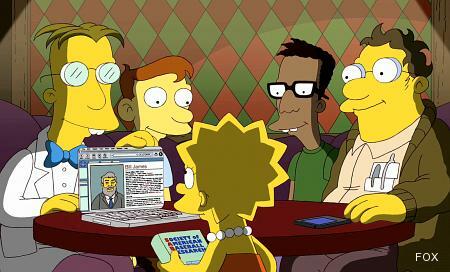 So now you’re back at your seat and you’re pretty inebriated and trying to keep up with what’s going on in the game. Don’t worry, GABP has you covered. The sightlines in the ballpark are fantastic and all of the seats are angled toward the field. The concourses on both levels are open so that you don’t have to miss any part of the game should you go to get snacks, drinks, or high tail it to the washroom. If you do happen to miss a key play, do not worry. 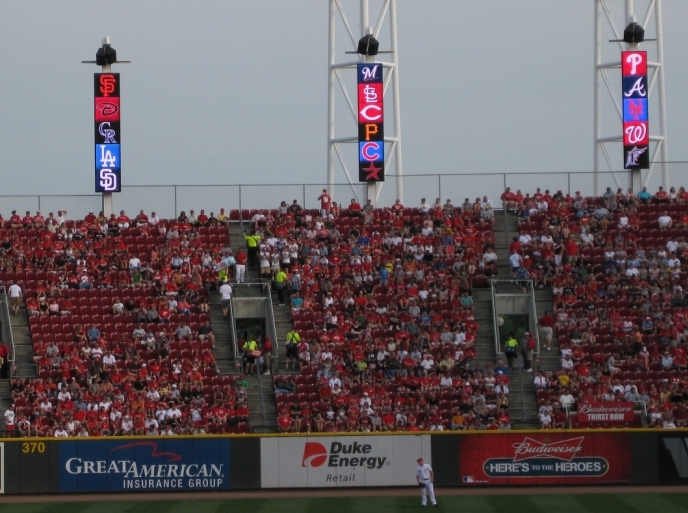 Great American Ballpark boasts the sixth largest scoreboard in all of baseball. It makes the scoreboards of Progressive Field and Comerica Park look downright bush league. 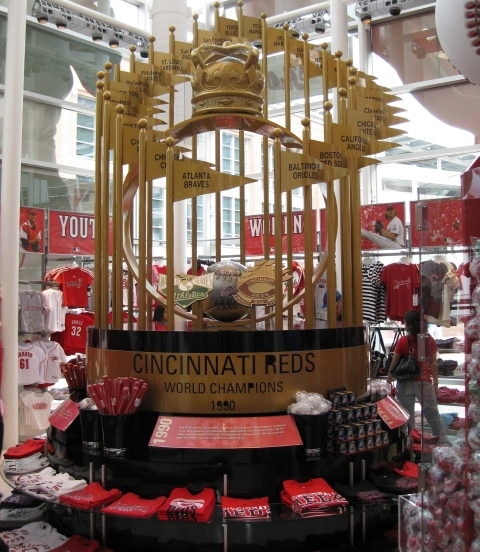 The Cincinnati Reds team store is in a separate building in front of the main entrance to the ballpark. It’s quite impressive – 3 levels with all the swag you could imagine. Attached to the store is the Cincinnati Reds Hall of Fame. 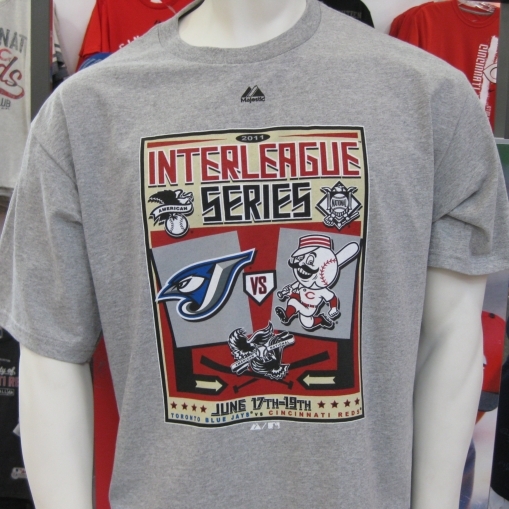 Of all the ballparks I have been to, the Reds’ team store has to be the second-largest next to the Blue Jays’ team store at the SkyDome Rogers Centre. Another nice touch is the fact that the team store stocks a limited supply of the opposing team’s merchandise to cater to visiting fans. Classy. When at a ballpark on the road, make sure to take in batting practice. YOUR Toronto Blue Jays are much more inclined to mix and mingle with their fans who made the 8 hour effort to support them. Your chances of picking up a BP ball are greatly increased, as Daperman found out. You also see some things you might not normally see at a home game. For example, have you ever seen this video before? 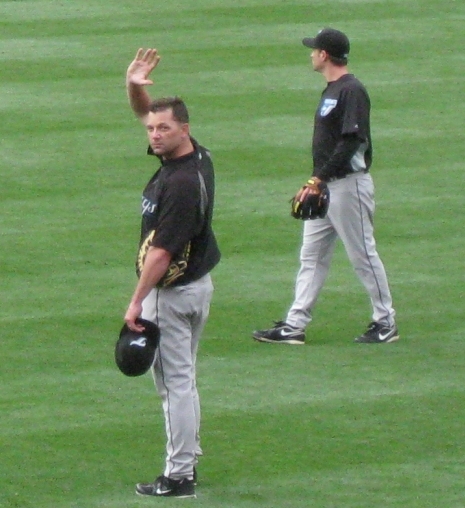 Blue Jays’ first base and outfield coach Torey Lovullo was doing a baseball version of the above video. Every time a batted ball came within the vicinity of Lovullo, he would pick it up and bat it back to the bucket seen above. He would either hit the bat boy in the chest, or bat the ball directly into the bucket. EVERY TIME. It was unbelievable. The bullpen would do sprints in the outfield during BP and at the conclusion, would get into a huddle and give each other a little pep-talk in a bromantic bro-down. Carlos Villanueva, despite being promoted to the starting rotation, still rolls with his homies in the bullpen. After BP you’re going to want to pick up some chow and Great American Ballpark has you covered. Alley Dogs features Kahn’s Hotdogs, Brats, Big Red Smokeys, Queen City Beef and Swiss sausages, Hot Metts, Popcorn and Soft Pretzels. Downtown/High 5/Crosley Grill specializes in 1/2 pound Burgers, Grilled Chicken Sandwiches, Chicken Tenders and an assortment of specialty topped French Fries. LaRosa’s Pizzeria has, you guessed it, a piece of Cincinnati “famous” LaRosa’s Pizza and Calzones. 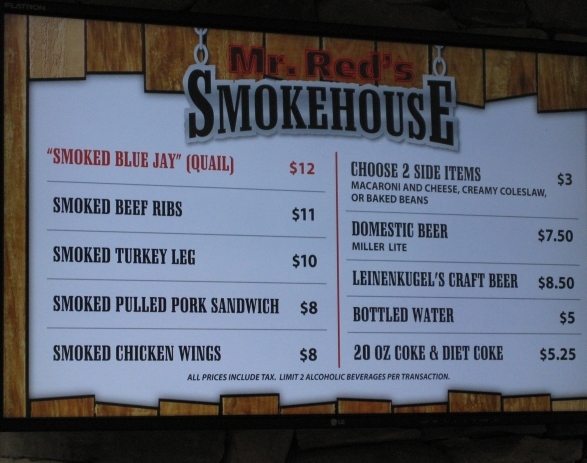 Mr. Red’s Smokehouse serves Cincinnati’s own Montgomery Inn Pulled Pork and Chicken. But they also have a “series special,” a menu item based on which visitng team is in town. 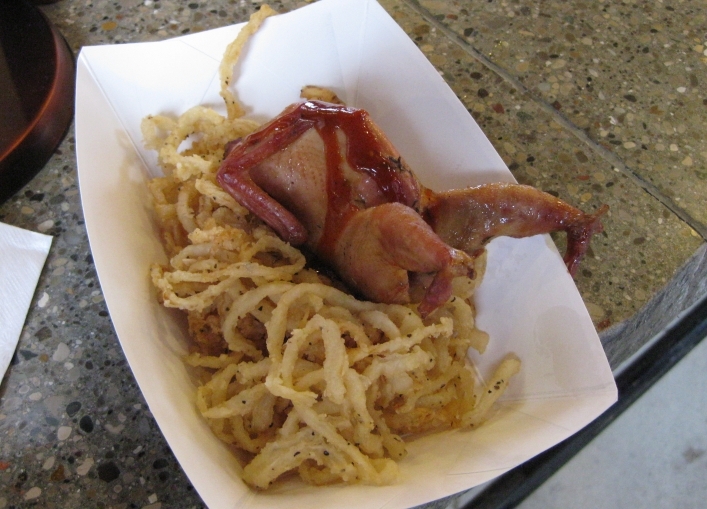 For this series it was the “Smoked Blue Jay” – but really it was Smoked Quail. Of course I had to have it. And it wasn’t very good. 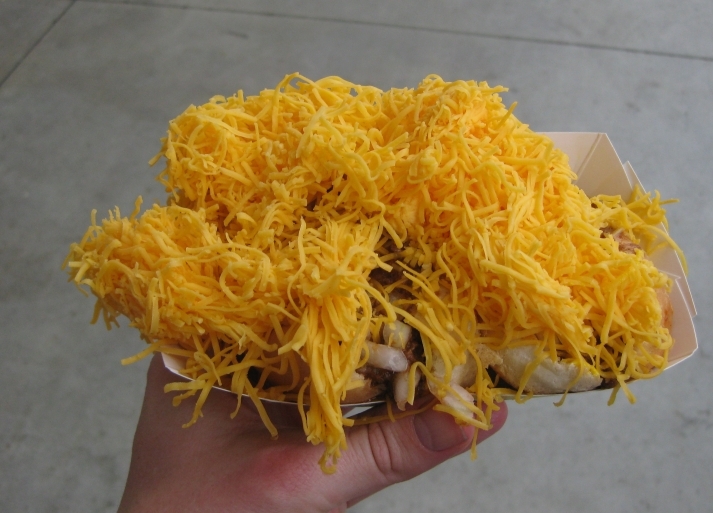 The piéce de resistance is the Skyline Chili – featuring Cincinnati’s own Skyline Cheese Coney. These things are wild. It is a regular hotdog covered in caramelized onions, mustard, chili and about a pound of cheese. 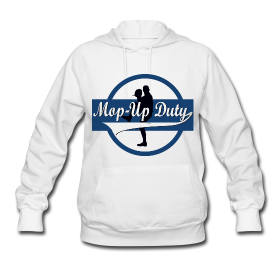 If you’re not into feeling like a corpse day-in, day-out at the ballgame…. well, I don’t know why this would be the case but if you are a weirdo and are trying to be healthy, GABP has you covered with healthy options. 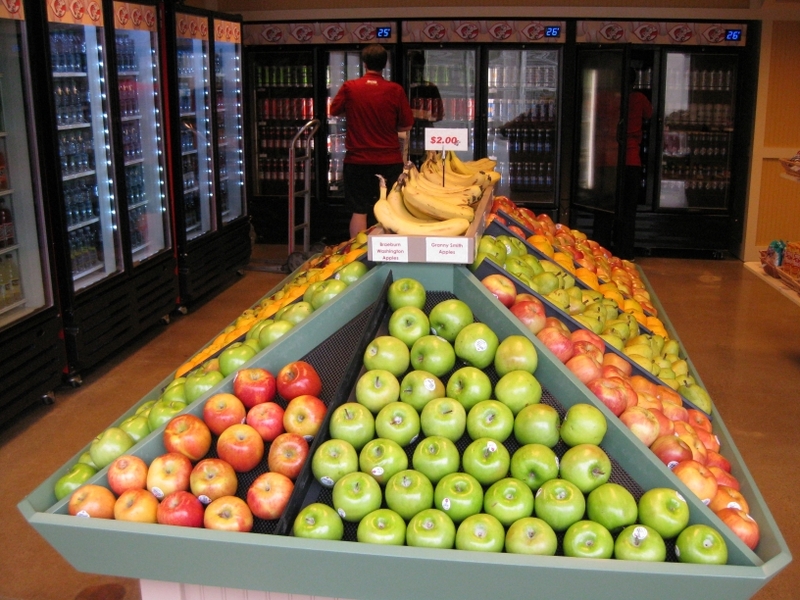 The United Dairy Farmers – while serving Chocolate/Vanilla Soft Serve Sundaes – also provide overpriced fresh produce. I have never seen this before in my life at a ballpark. Kinda neat. So, what else is there to do in the Cin City? Not a heck of a lot, really. Since we stayed near the University of Cincinnati campus, we toured around it. Home of the Bearcats, the campus is very tidy and aesthetically pleasing. 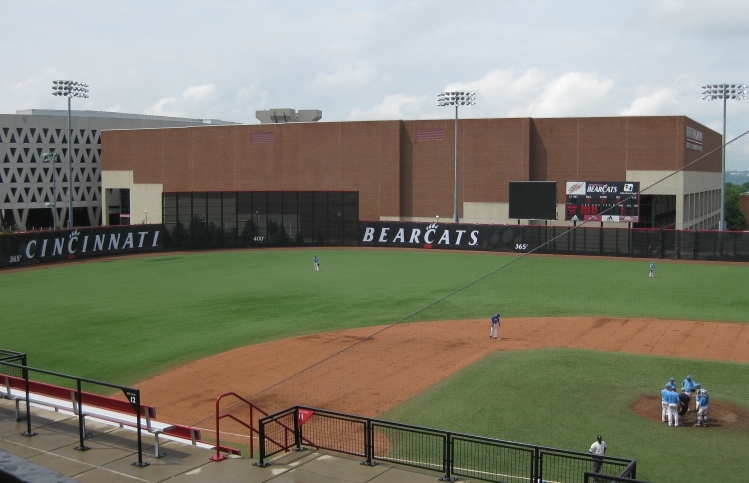 The Bearcats baseball team play out of a gorgeous baseball stadium named after Marge Schott (former Reds owner), who no doubt donated millions to the school. On this day we saw some sloppy 17-and-under elite baseball, but the ballpark was so nice it didn’t really matter. Another thing we like to do when following the Jays on the road is to look for old ballparks that the home team used to play in. Early and I were shaking like leaves on a tree to see the site where old Crosley Stadium used to be. Crosley Field was a cozy little ballpark with a number of quaint and amusing features. It was most famed for the outfield slope that served the purpose of a warning track, but often gave visiting team left fielders the fits. Babe Ruth once tripped out there during his final season, and expressed his disgust. Crosley Field stood out from all the rest in two other ways: it was the first major league ballpark to install lights for night games; this was done in 1935. For most of their history the Cincinnati Reds were a second-tier team, winning the World Series only in 1919 (against the Chicago “Black Sox” who threw the Series for bribes) and in 1940. To handle to big crowds, in October 1919 they built temporary bleachers over York Street behind the left field wall, and in October 1940 they added a small bleacher section on the slope in the left field corner, shown in the 1938 diagram above. In the 1960s, the Reds finally became a regular strong contender, helped by the batting and fielding excellence of Pete Rose and Johnny Bench. If the Reds had not traded Hall-of-Fame slugger Frank Robinson to the Orioles, they might have won the World Series even earlier than they actually did. Not until they finally abandoned old run-down Crosley Field in 1970 did the “Big Red Machine” really get going. Unfortunately, all that remains of Crosley Field is this difficult-to-locate plaque in the front garden of a manufacturing facility. Disappointing to say the very least. Not worth even searching it out. 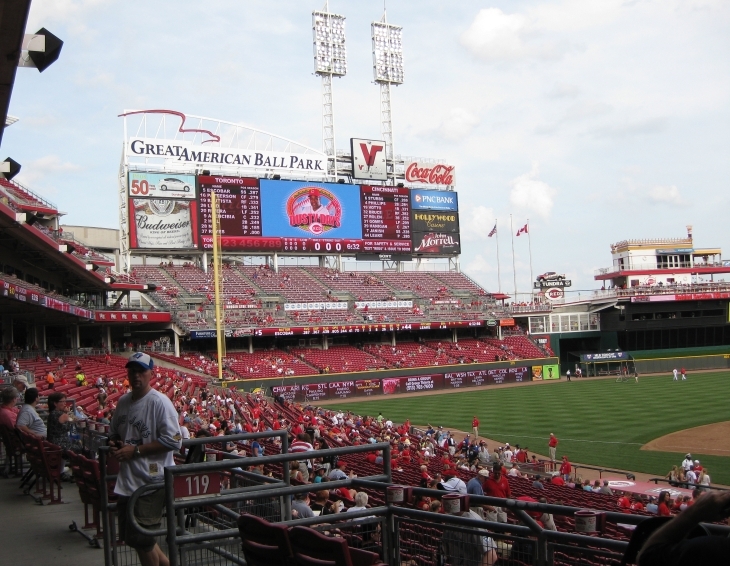 At the end of the day, if I had to stack Great American Ballpark up against the ballparks I had reviewed last year, I would put it just after AT&T Park and ahead of Comerica Park. Thus concludes the Great American Ballpark review! Questions and comments are welcome. 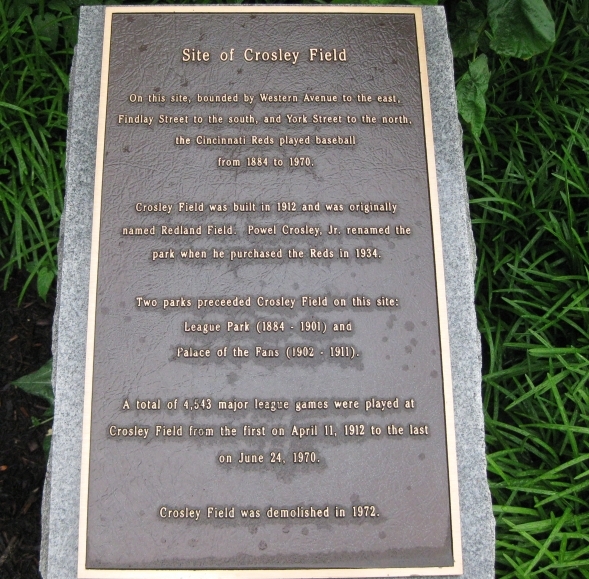 Note: Crosley Field info taken from Andrew Clem’s ballparks, photos taken by ME ME ME. How does the gap make it possible to have the upper deck closer? If there is a real function to it i would love to hear it. I think it is an abomination. Looks like they have a tooth knocked out. The ballpark neighbourhood is virtually non-existant but it seems that they are sexing up the riverfront and there is lots of pending and nearly complete buildings. This is similar to what was around Skydome when it opened in 1989. The “Gap” allowed the architects to rotate the seating along the left field line so that the upper deck seating is much closer to the playing field than in most other ballparks. Terrific article Callum. I’ve thought about having free agent Friday on my fantasy baseball blog, but the same problems that occur at Great American worry me. I love checking out new parks and I’m actually going to Coors Field for the first time this summer. I’ve already been to Wrigley and Citi this year. I think that interleague needs to stay around because of opportunities like the one you guys had. Much thank yous. Learning about new lodging options is usually quite helpful for us travelers.